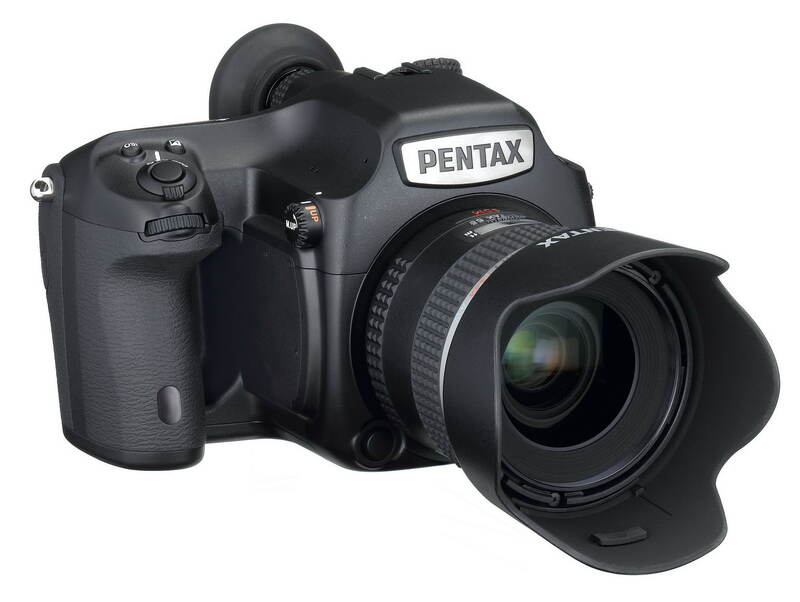 At LAST: CMOS Pentax 645D and more! DENVER, CO, February 5, 2014 – RICOH IMAGING COMPANY, LTD. is pleased to announce the exhibition of four reference products at CP+ 2014, taking place February 13-16 at the Pacifico Yokohama convention center in Japan. Included in these reference products are a medium-format digital SLR camera, interchangeable lenses and camera accessories which are currently under development. Produces digital duplicates of silver-halide-film images in combination with a digital SLR camera and a dedicated flash unit. High resolution pictures from the press release. I see tiny holes on each side of the pentaprism cover of the new Pentax. They look like holes for microphones. Would that mean that the camera is able to shoot video? Thanks for adding the image, Jerome! I can't imagine Ricoh not exploiting Pentax experience to the full. now will this be the same CMOS sensor used by Hasselblad and Phase One? Where are you? We need you to look at the new body and tell us what is different!! I do not own a Pentax 645D but really am fascinated by this important choice for MF photographers. So if you see errors or please correct them! We'd love your ideas and insights to the significance of the new CMOS version of the already well-regarded 645D. 1. Instead of just "User" we have storage options for U1, U2 and U3. 2. On the left, there's a change in the buttons behind RAW. SD1 and SD2 replaces with "AF AREA" and "Lock"
4. The control 4-way rocker on the back now has informative icons for flash, white balance, multiple shots and a large dome, which I guess might be some studio setting??? Is this very different than the functions the rocker controlled previously? 5. The large articulated rear LCD has no buttons below, so presumably this will turn out to be touch screen and the buttons will be at the lower border perhaps? I am happy to read about these developments and I realize that you're very excited. I respect that. The following two announcements, however, are imo pure marketing: "We are going to announce something but we don't know what and we don't know when". Well, my thoughts are that Pentax could very well pull a scoop on everyone. With essentially the same Sony 50MP CMOS sensor or perhaps coming in slightly larger, Ricoh Pentax will be competing with both Hasselblad and Phase One with technology both Ricoh and Pentax separately themselves mastered long ago, unlike Phase One and Hasselblad who are new to the CMOS sensor. Pentax has had to merely adapt their extensive CMOS experience with many generations of state of hte art CMOS DSLRs. So there's no pressure or expense to discover new technology, apart from exploiting the nuances of the latest Sony chip, if that indeed turns out to be the source of their new sensor. 3. More desirable AF lenses at focal lengths that Pentax users have to go to MF older Pentax glass. I think a lot of folk migrating to MF would seriously consider the Pentax 645D II and save over $22,000 for lenses and for a rainy day! The AF zoom wide angle lens has an extra button. Hmm, I wonder if this could be for image stabilization??? Hmm that would be a first for MF!! It simply seems that the buttons that used to be at the bottom and right of the fixed screens have been moved to the sd1/sd2, 4-way rocker and extra buttons at the bottom right of the screen. One also sees a window for an ir remote sensor below the rocker, which used to be further down. The plug for the remote changed position to the top of the handle (you can barely see it on the front view, near the ring for the carrying strap), so there must be more buttons behind the screen near that zone. If you examine the file carefully, there is evidence of erasing something or taping it black near that zone, probably an indication as to what the buttons are for. - and, finally, in a year, sell them to anyone including Pentax at 2000$ a piece. The prices, dates and quantities are just invented and likely to be false, but the general idea is likely to be true. The investments to develop the cmos sensor is likely to have been colossal and needs to be divided on a very small number of components. The whole market for this product is probably only a few thousands. Could be like that Jerome, but Pentax plans to deliver the 645D II in spring 2014 and that would be this April! 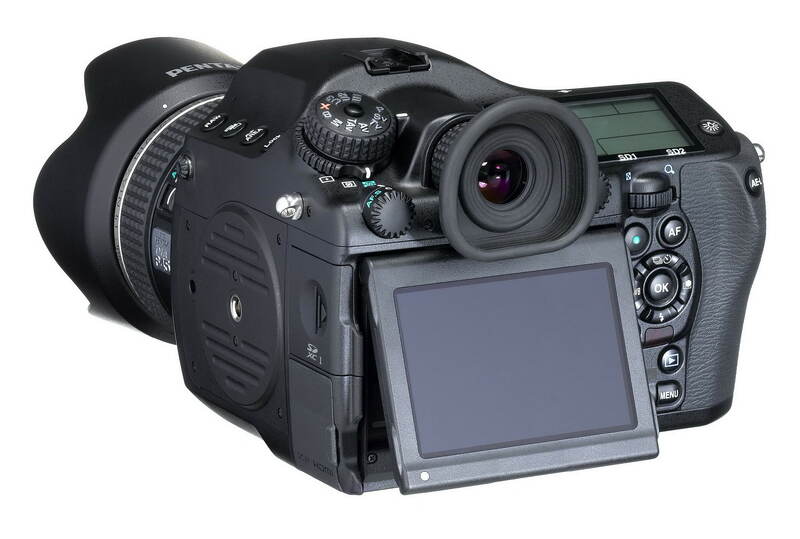 If the AF, EVF refresh rate and live view are as good as they should be, then Pentax is likely to be a major beneficiary of every positive review of the Phase One and Hasselblad options for the Sony CMOS containing camera. Only those of us already owning, (for trade in), a Phase One or Hasselblad body and existing lenses are likely to ignore the Pentax alternate option, now suddenly available. If Borrowlenses.com, for example, stocks up with this camera, then it will really make headway in the MF professional space as folk like to be able to rent an extra body and or lenses on an important assignment. Currently, they only offer the Hasselblad system! Could be like that Jerome, but Pentax plans to deliver the 645D II in spring 2014 and that would be this April! I suppose that you know the word: vaporware. We'll see in april what materialises. That's the word I have initially used in my post above but I didn't want to sound too distrusting and I have therefore changed it. But the sentiments remain, nevertheless. I do not think that the word vaporware is fitting, because these are tangible products that are pre-announced by the corporation itself, but naming and general availability is TBD. Vaporware is commonly used for rumored products without reliable validation by a credible source. Given the discounted pricing for the 645D (first model), there has been a plan to replace the 645D for quite some time already, but apparently the decision was made to postpone the introduction and skip the larger Kodak/TrueSense KAF-50100 50MP CCD in favor of the new Sony CMOS device with the same resolution. This new sensor required a redesign of some of the camera features, but that has probably been going on for a few months already, to be finalized soon. Make no mistake, orders for such sensors have had to be committed to well ahead of time, because that determines the unit price. The setup cost for such a production run is huge, so once set-up one had better produce as many as the market can absorb. The production lines will then be refitted for the production of other products. The two lenses are not defined at all other than one being an ultra wide and the other one being a telephoto. No details on even the most basic characteristics such as the focal length and the aperture. This doesn't make them tangible imo. For the rest I fully agree. My point was not to discuss the definition of vaporware, but rather to express my doubts about the idea that Asher may be able to buy a cmos Pentax on the first of April... Wasn't the Pentax MF delayed for years anyway? What does "available" mean? A trickle of cameras for a few selected Japanese customers (the 645D was only available in Japan originally)? Furthermore: if this camera can be used for video (as the microphone holes seem to imply), prepare yourself for shortages. Enough filmmakers will go crazy for it. I wonder how long it will take Sony to build this sensor into a larger A7r? Ricoh is now behind the new body and I think they mean business as they have made the commitment to get those sensors some time ago. Why would Sony do that? They already have 3 different main product lines for cameras (the DSC - compact line, alpha and nex ranges) and their lens line up is fractioned between 2 bayonets, 2 sensor sizes and 2 high-end brands (Zeiss and "G"). And, as bizarre as these cameras can look, they manufacture the Lunar and HV abominations, which are again in 2 different bayonets. If there is something that Sony does not need, it is yet another series of lenses, and that would be necessary for a MF sensor in a larger A7. If one looks inside the workings of a Sony A7 camera, one learns very well the culture of focus the company has in its camera products. It is simplified compared to Nikon and Canon, having less screw size variations, easier assembly and far easier disassembly for repair. That philosophy, it would be reasonable to assume, would go into their game plan for maximizing their profit in different sectors. For the full frame segment for pros and enthusiasts, they have garnered for themselves a high place in the choices we make. As they produce more lenses, this segment will grow, but at the expense of their competitors. Unlike nikon and Canon, they do not destroy another profit line by providing a small full frame sensor camera at a super-competitive price. For the "big guys", they constantly have to cripple entry level or enthusiast offerings so as to keep the flagship market going. In the end, however, they are forced to make compromises. 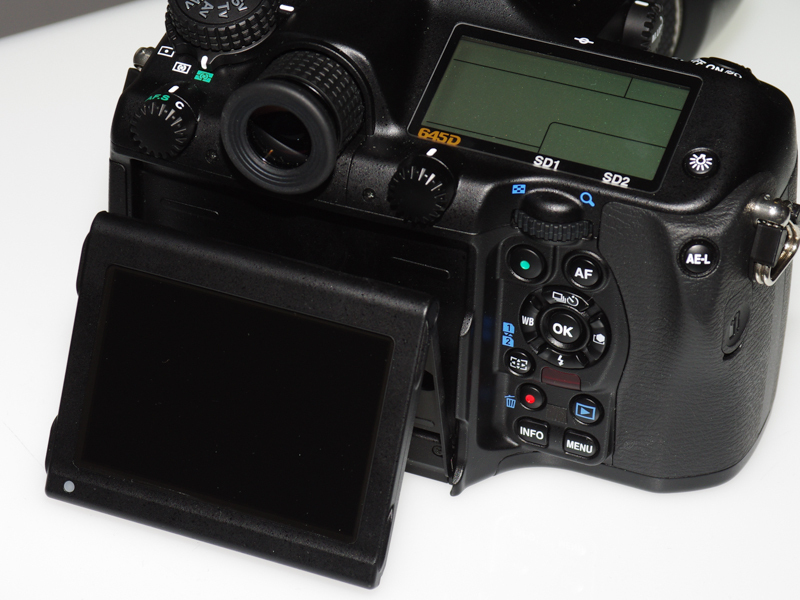 One is the 6D which has the 5D III quality sensor, (but depleted focus points). However, any experienced photographer can adapt and get just as good pictures for everything -- except the most challenging sports shots saving at $1000 or more for the lighter weight body. For Sony, with their A7 and A7R, (and Pentax with their fabulous K3 APS-C DSLRs), they can provide all the technology they have ready in less versions and get good revenue streams without cannibalizing their other income streams. So for the small MF segment, Sony takes a major slice of profit in what they do efficiently, make great sensors. They need little storage space, modest transportation costs and almost no marketing at all. Consider, they need no new buildings and production facilities for MF bodies and lenses. They don't have to schedule gaps in production of other bodies to fit in a MF production run. They just get the first cut of the chain of profits in almost anyone building a CMOS MF camera. Its beautifully efficient. I've been following the rumors for some time now. The first announcement of the 645D combined with the long delay until it arrived on the marked was on one hand a running gag for those who did not wait and on the other hand painful for those who had a 645 system with a couple of lenses waiting for a digital body. The acquisition by Hoya, management decisions etc. probably did not help to advance things. The strongest indicator that Peantax was actually serious about the 645D is the fact that the MF lenses for the 645 system were maintained as regular product all the time without a new body available for a while. This was certainly not the finest moment in product marketing for Pentax. Apart from the above, Pentax was more on the consistent side when you look on the DSLRs and lenses. Sure, there were changes in the roadmap and the refusal to work on a 24x36mm sensor camera, but for the rest pretty much everything arrived. So I do not see a Vaporware angle for the new Revision of the 645D. Ramping up the production will be most likely a question of component availability compared to ramping up a production for a new body type in general as it was for the 645D. The announcement is there and there is reasonable hope/confidence that it is not just another announcement. If there is a video function it will make an impact. The tilted display combined with live view would make it a good camera for shoting from the hip. If the AF is as good as the AF for the K-3 and the processing is faster, then it could become interesting for shooting faster subjects - a field not that common for digital MF. The idea of a digital MF rangefinder (sort-of) is something that fascinates me for some time now. I do not know if there would be enough customers, but if the mount acceepts maniya 7 lenses, this could be even more interesting. I must check that out. I have never come across this feature. What on earth is it for? One can do separate WB of a region of a scene? I do not know if there would be enough customers, but if the mount accepts Mamiya 7 lenses, this could be even more interesting. Yours is a brilliant idea. It would be very popular as the rangefinder is easy to focus and the lenses are regarded as stellar. I can imagine a Sony sensor in this body, it would really make a lot of sense. the correct wording is actually Multi-Pattern Auto White Balance. I am rpetty sure you find it in the Ricog GR (I did not look though). I am pretty sure you find it in the Ricoh GR (I did not look though). I'm so surprised I missed this! A better term would have been, "Multizone" WB, since that's what is comes down to. Still, let's use the official term! Unfortunately for me, I'm so used to processing from RAW images that I never even bothered with AWB v. Multi-Pattern WB! My loss! The technology is very ambitious, segmenting a picture that's not rainy into shade and brighter areas and then doing a discrete WB in each area. It's not clear that how Ricoh might deal with the DNG file. Does it have guides in the EXIF to allow 3rd part RAW translators to use the benefits of the Multi-Pattern WB, or is that sophistication lost. Perhaps the adjustments are already applied at pixel level within each zone and so the RAW processing has no particular knowledge of what's been done? But then each pixel would be already color corrected, and so there's a bunch of questions to be answered. Does even, the Ricoh-provided, Silkypix software use this Multi-Pattern WB information when we process their DNG images? Still, lets imagine that we can indeed obtain the benefits of Multi-Pattern WB processing with Pentax-Ricoh RAW images, then application to the new 545D MD CMOS processor could provide a major advantage over the Phase One and Hasselblad iterations using the same 50 MP sensor. I use a profile made with a Gretag MacBeth color chart for each camera I have and also grey cards included in the shoot. So how does that fit in with using Multi-Pattern WB? Let's imagine that one cannot use the advantages of the Ricoh Multi-Pattern WB in processing of Ricoh-Pentax files. I wonder then if we could create a color correction mask to extract the zones from the JPG image and then apply ones' own curves to the delineated regions of different light. It is not a major challenge to take a picture of a grey card in the area of sunlight of flash and then apply these to the separate zones receiving such different light. So I do not see a Vaporware angle for the new Revision of the 645D. I would like to make clear that when I said "vaporware", I only thought about release date. I am pretty sure that the camera will be issued, but I doubt that it will be available in April. I do not know if there would be enough customers, but if the mount accepts maniya 7 lenses, this could be even more interesting. The Mamiya 7 is a 6x7 camera. Digital sensors of that size are not likely to be available in the coming decade. What Sony could do, as far as digital rangefinders go, is to use the new MF cmos sensor in a RX-1 like camera (with a fixed lens, then). But it would cost about 10000$, so I am not sure they see a market for that. IT WILL NOT replace the 645 D which will continue to be distributed. It is an evolution with much more properties than the 645D, the aim being to be useful to more different type of photography/photographers. Don't loose your time (unless it's fun for you ; ) with rumored vapors, but stay tuned! Even if it is one, two or three months late in terms of general availability, the term does IMHO not apply. It is the Mamiya 7. As Mamiya is part of LEAF - was there never the idea to replace film with a decent MF sensor? In none of both postings I did indicate that I wanted to have a 6x7 sensor, I was more referring to a MF sensor in general. I mentioned the Mamiya 7 lenses because of the flange focal distance and a camera accepting these lenses with a MF sensor would be a good thing. The lenses are good and relatively compact. There could actually be a market for a compact body that accepts the Mamiya lenses and - using adapters - other MF lenses. A hybrid viewfinder like on the Fuji X100s would be a plus on such a camera. Now a 6x7 sensor as you imply could be interesting, but given the resolutions of current MF sensors cropping is OK except for wide angle where you effecively lose field of view. A camera with fixed lens does not have a market from my point of view. But, besides of that, I think it is very interesting to hear all these news about new MF cameras (in the same period of time). Would it seems that the MF market is being awaken? Good news! everything that brings more quality, means more competition (between manufacturers but also between photographers!). Your communications are lean and precise! This could cause quite a revolution, LOL! Big Red at Target prices! Pentax should use the Target company's pitch, "Expect more, pay less!" If this works to a professional level, 3rd part companies will lavish it with all the extra's needed for follow through and zoom focus and more!